Be the first to share your favorite memory, photo or story of Sharran. This memorial page is dedicated for family, friends and future generations to celebrate the life of their loved one. 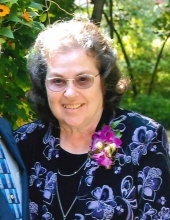 Sharran Balts, 77, of Eau Claire, passed away Saturday, September 8, 2018, with her family surrounding her. Sharran was born in Eau Claire, WI to Harland and Viola Dascher on November 16, 1940. Sharran attended Eau Claire Area Schools. She married the love of her life, Richard Balts, on September 20, 1958. She loved cooking and was great at it. Her parents had one of the first restaurants on Hastings Way, The Gold Ribbon Frozen Custard Drive Inn. It was there she realized her passion for cooking. Later, Sharran and Richard owned The Westerner Restaurant on the west side of Eau Claire for 16 years, where Sharran made her famous pies using her mother’s recipe. Sharran was a loving mother who adored her family and kept them close. She had a wonderful sense of humor, loved food, and enjoyed shopping and traveling. Her home was always a place of comfort and love. Our hearts are broken, and she will be forever missed. Sharran is survived by her husband of 60 years, Richard; five sons, Darwin (Dana) of Eau Claire, Delvin (Kelley) of Eau Claire, Darryl (Debbie) of Eau Claire, Jason (Sarah) of Elk Mound, and Nathan (Gail) of Elk Mound; 12 grandchildren; 9 great-grandchildren; two brothers, Jarrette Dascher and Abin (Terri) Dascher; sisters-in-law Lois (Orland) Gustum and Carol (Marv) Michels; and numerous nieces and nephews. She is preceded in death by her daughter, Dawn; parents, Harland and Viola Dascher; and brother, Harland Dascher, Jr.
John 3:16 For God so loved the world that he gave his only Son, that whoever believes in him shall not perish but have eternal live. Funeral services will be held at 11 am Friday, September 14, 2018 at Stokes, Prock & Mundt Funeral Chapel 535 Hillcrest Parkway Altoona, Wi. Friends may call from 4 – 7 pm Thursday, September 13, 2018 at the funeral chapel. "Email Address" would like to share the life celebration of Sharran Ann Balts. Click on the "link" to go to share a favorite memory or leave a condolence message for the family.